European Championship in Dresden is the event of high status and of mass participation. Several hundred games were played daily, a good deal of them by high-class chessplayers. It was not difficult to find something original, instructive, theoretically important or merely aesthetic. On the contrary, I had to remind myself that 'one cannot embrace the non-embraceable'. In this part I review the first half of the championship. 1.e4 c5 2.¤f3 d6 3.d4 cxd4 4.¤xd4 ¤f6 5.¤c3 a6 6.Ґc4 e6 7.Ґb3 b5 8.Ґg5 Ґe7 9.Јf3 Јc7 10.O-O-O ¤bd7 11.e5!? 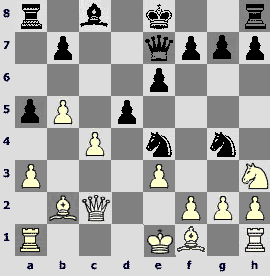 NowadaysWhite lays certain hopes on this pledging move first tried in Stocek – Dydyshko, Plzen 2002. 11...Ґb7 12.Јg3 dxe5. The alternative is 12...¤xe5!? 13.Ґxe6 fxe6 14.f4 ўf7! 15.fxe5 dxe5 16.¤xe6! ўxe6 17.Јh3+ ўf7 18.Ґxf6 gxf6 19.¦d7 Јc6 20.¦hd1 ¦ad8 21.Јh5+ ўe6 22.Јh3+ ўf7 23.Јh5+ ўe6 and a draw in Nisipeanu – Karjakin, Foros 2006. 13.Ґxe6 fxe6 14.¤xe6 Јc6 15.¤xg7+ ўf7 16.¤f5. In today chess the advantage in debut preparations is nearly a decisive factor in similar positions. Ivan Cheparinov confirms his reputation of a strong analyst once more. 16...Ґf8!N. In the primary source there was 16...¦ag8 17.¤xe7 ўxe7 18.f4 h6 19.fxe5 ¦xg5 20.exf6+ ўf7 with complicated struggle, but Black can save his bishop yet. 17.¦he1. After 17.Ґxf6 ¤xf6 18.Јxe5 Јc5!і white queen is driven away from the active position and a piece becomes stronger than three pawns. 17...¦e8. 17...¦g8!? is good also. 18.Јh3 Јe6! A strong move. Black neutralizes his opponent's initiative accurately and gradually shifts to realization of his material advantage. 19.f4 e4. No need to play 19...Ґxg2?! 20.Јxg2 Јxf5 21.Јb7 Ґe7 22.¤d5›. 20.g4? Next move was probably an unpleasant surprise for White. Unhurried 20.ўb1!? was preferable with continued struggle. 20...h5! 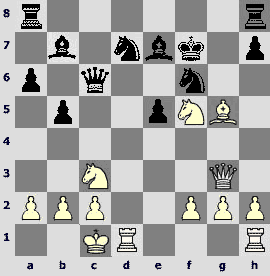 An excellent counter-strike at the side where White was attacking. Of course, Cheparinov saw his 22nd move in advance. 21.Ґxf6?! 21.¤e3 is more persistent. 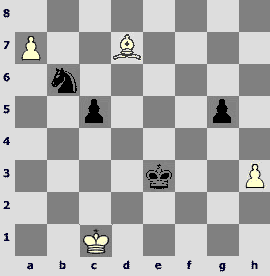 Black may answer 21...Ґe7 22.f5 Јc6! (strengthening d7-knight) 23.Ґxf6 Ґxf6µ, or 21...Ґb4 22.f5 Јe5 23.Ґxf6 ¤xf6 24.g5 Ґxc3 25.bxc3 ¤d5µ. 21...¤xf6 22.g5 Ґc8! No need to comment the following. 10.a5!? Sergey Dolmatov's idea. The point is that after 10...¤xa5 11.¦xa5! Ґxa5 12.dxe5 (Dolmatov – Sivokho, St. Petersburg 2000) White obtains a dangerous initiative for sacrificed exchange. 10...Ґa7 11.h3 O-O 12.Ґe3!? A perspective pawn sacrifice. 12...exd4 13.cxd4 ¤xe4 14.Јc2 Јe8 15.¤c3. Naive 15.Ґd5? 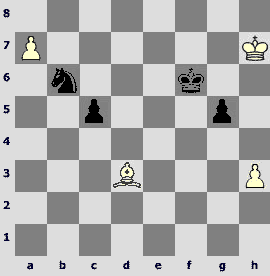 ¤b4 16.Јxe4 Јxe4 17.Ґxe4 f5 leads to Black's advantage. 17.¤e4!?N. An interesting novelty. 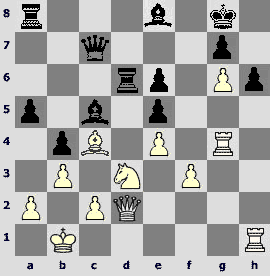 After 17.d5 ¤b4 18.Јd2 Ґxe3 19.¦xe3 Ґb7 (P.Smirnov – Kazhgaleev, Moscow 2007) White gets no more than compensation. 17...¤xe4 18.Јxe4 ¤e7?! Causes serious troubles. Stronger is 18...¦e8 19.Јh4 d5! (against d4-d5), though White is still better. 19.¤g5! ¤g6. If 19...¤f5, then 20.g4. 20.Ґd5! Black pieces are chained. It is very difficult to co-ordinate them. 20...c5?! Weakening of the d6-pawn is critical. 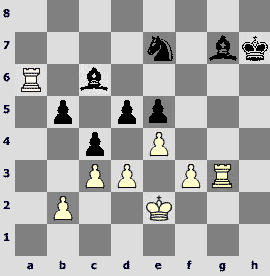 20...Јf5 21.¦ac1 Јxe4 22.Ґxe4 c5 23.dxc5 dxc5 24.Ґxc5 Ґxc5 25.¦xc5 Ґb7 led to worse ending but left chances for escape. 21.Ґf4! Black has visible problems with moves, there is a threat of a strike on f7. 21...cxd4? Loses forcedly though other lines are bad also: 21...Ґb7 22.Ґxb7 ¦fe8!? (22...¦xb7 23.Ґxd6) 23.Јc6 Јxc6 24.Ґxc6 ¦xe1+ 25.¦xe1 ¤xf4 26.¦e7± or 21...ўh8 22.¤xf7+! ¦xf7 23.Ґxf7 Јxf7 24.Јe8+ Јg8 25.Ґxd6 ¦a8 26.Јc6 Ґb8 27.dxc5±. 22.¤xf7! Simple calculation shows guaranteed winning of material by White. 22...¦xf7 23.Јe8+ ¤f8 24.Ґxd6! Јxe8 25.¦xe8 Ґe6 26.¦xe6! ¤xe6 27.Ґxb8 Ґxb8 28.Ґxe6. Black lacks exchange and their further resistance is senseless. 1.e4 e5 2.¤f3 ¤f6 3.d4 ¤xe4 4.Ґd3 d5 5.¤xe5 ¤d7 6.¤xd7 Ґxd7 7.O-O Ґd6 8.Јh5. 8.c4 and 8.¤c3 happen more frequently. 8...¤f6 9.¦e1+ ўf8. The loss of opportunity to castle is not of essential importance: Black gets an advantage in development instead. 10.Јe2. 10.Јh4 ¤g4= is known to lead to an equal ending. 10...¤g4! Artur Jussupov acts extremely energetic from now on. 11.g3 Јf6 12.c3 ¦e8!N. In Korneev – Nielsen, Germany 2006, there was 12...h5 13.h4 ¦e8 14.Јf1 ¦xe1 15.Јxe1 Ґf5, but Black hopes for more and does not give an opportunity to play h2-h4 to his opponent. 14...¤xh2! A spectacular and absolutely right decision from the practical point of view. White must have non-human self-possession to hold his ground after the sacrifice. 15.ўxh2 h5! 16.ўg1. Another way – 16.ўg2, Black may answer 16...h4 17.¤d2 hxg3 18.fxg3 Јh6 19.Јg1 Ґh3+ 20.ўf2 Јf6+ 21.¤f3 Ґg4 22.Ґe2 ¦h3 23.Ґe3 ¦xg3 24.Јxg3 Ґxg3+ 25.ўxg3 Ґxf3 26.Ґxf3 Јg6+і with eventual 27...Јc2 (V.Belov, www.russiachess.org), though 21.ўe1!? worth attention. 17.Ґf1? Leads to a loss. The main threat is 17...hxg3 18.fxg3 Јf3. Neither17.Ґf4? hxg3 18.Ґxd6+ (18.fxg3 Ґxf4 19.gxf4 Јxf4°) 18...cxd6! 19.fxg3 Јf3° nor 17.Јe3? hxg3 18.fxg3 ¦h3 19.ўg2 ¦xg3+ 20.Јxg3 Ґxg3 21.ўxg3 Јe6! 22.ўf2 Јh3° saves. Only 17.Јf1! gives hope for a happy-end. 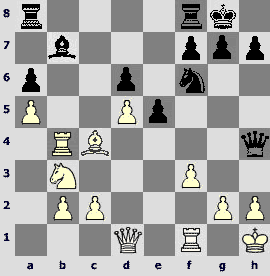 White having found the defence, the game might end by repeating moves after 17...hxg3 18.fxg3 Јe6 19.Јe2! Besides, 17...c5!? is interesting (V.Belov), though in the variation 18.Ґe3 c4 19.Ґe2 Јg6 20.g4! Ґxg4 21.Ґxg4 Јxg4+ 22.ўh1 (22.Јg2? Јd1+ 23.Јf1 Ґh2+ 24.ўg2 h3+°) 22...Јf3+ 23.Јg2 Black has no more than perpetual check. 17...hxg3 18.fxg3 Јg6! White is defenceless now. 19.Ґg2. If 19.Јe3 Ґxg3 20.Јg5 (20.Ґg2 Ґh2+ 21.ўf2 ¦h5°) then 20...¦h1+! decides: 21.ўxh1 Јh7+ 22.ўg2 Јh2+ 23.ўf3 Јf2#. 22.Јb2+! ?N.A new try in the known gambit line. Earlier they played 21.¦d3 and 21.¦d4. 22...ўg6. If 22...e5 then 23.¦d5 must be taken into account. 23.¦a3! Vladislav Tkachiev fortifies his attack with his queenside rook. Now 24.¦f3 threatens. 23...g4? 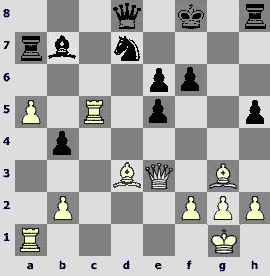 It is always difficult to defend oneself, and Black makes a possibly decisive mistake. He should play 23...e5! freeing the e6-square for his queen. 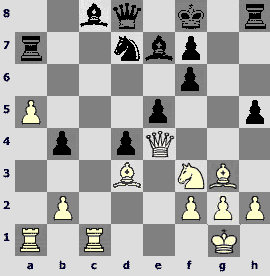 The text move allows to White to cling to Black's king shelter. 24.h3! Now it is highly problematic to find an escape for Black. 24...h5 25.¦g3 f6. If 25...ўh7 then 26.hxg4 hxg4 27.Јe2 ¦g8 28.f3; on 25...Јg5 also follows 26.hxg4 hxg4 27.Јe2 f5 28.f3 with a formidable attack. 26.hxg4 hxg4 27.¦d4 ўf7 28.c5! Fortifying his bishop first, White approaches his heavy pieces to the black king inexorably. 1.e4 c5 2.¤f3 d6 3.d4 cxd4 4.¤xd4 ¤f6 5.¤c3 a6 6.Ґe3 e6 7.f3 Ґe7 8.Јd2 ¤c6 9.O-O-O ¤xd4 10.Ґxd4 O-O 11.g4 b5 12.g5 ¤d7 13.h4 Јc7 14.ўb1 b4 15.¤a4 Ґb7 16.b3 Ґc6 17.¤b2 a5 18.h5 ¤e5. The game came to an actual position of the English Attack, Both partners playing it not for the first time. 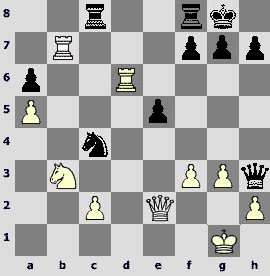 Since Leko – Kasparov, Linares 2003, where there was 19.Ґe2 a4 20.¤c4 Ґb5, Black is considered all right. Oleg Korneev tried 19.¦h3!? already and has prepared another surprise for this game. 19.Ґxe5!?N. The move causes distrust at first, even subconscious. Why, White gives away such a good bishop freeing its opponent simultaneously, and weakens black squares around his king drastically. But general considerations step back here. The strong knight eliminated, White drives his bishop to c4, knight to d3 and then launches attack on Black's king. 19...dxe5 20.Ґc4 ¦fd8 21.¤d3 Ґe8? Too sluggish and so fatal for Black. It is more logical to open the a-file by 21...a4! 22.g6 axb3 (if 22...Јd6?! then 23.h6!‚) 23.cxb3 and then 23...Јa5!, and in case of 24.h6 hxg6 25.hxg7 ўxg7 26.Јh6+ ўf6 White has nothing more than perpetual check. 22.¦dg1. 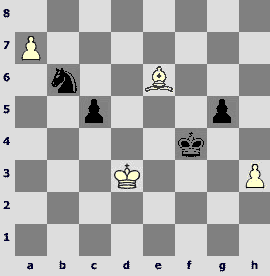 On 22.g6 Black planned 22...h6. 22...Ґc5 23.¦g4 ¦d6? The e6-point needs an extra protection but Black goes wrong way. 23...Јe7! 24.g6 Ґd4 gave chances to organize defence. 24.g6! Everything is ready for the final storm. 24...fxg6. Not to react is also dangerous: 24...Ґd4 25.gxh7+ ўxh7 (on 25...ўh8? finely wins 26.¦xg7! ўxg7 27.Јh6+! ўh8 28.Јf6+ ўxh7 29.h6ќ) 26.Јg2 f6 (26...f5 27.¦g5±) 27.f4±. 25.hxg6 h6. Or 25...Ґxg6 26.¦xg6! hxg6 27.Јh2 ¦xd3 (27...¦c8 28.¤xe5ќ; 27...¦ad8 28.Јxe5ќ) 28.Ґxe6+ ўf8 29.Јh8+ ўe7 30.Јxg7+ ўd6 31.Јxg6ќ. 26.¦xh6! The final combination has been calculated irreproachably. 26...gxh6 27.g7 Јf7. No other way. 28.Јxh6 Јh5 29.Ґxe6+ ¦xe6 30.Јxe6+ Ґf7 31.Јc6! An important resource. 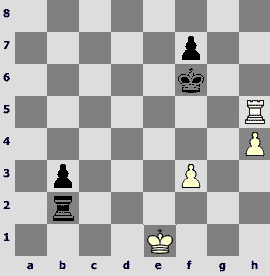 White regains material in abundance and obtains winning position. 11.¤d4?!N. 11.Ґxc5 or 11.ўb1!? looks more natural. 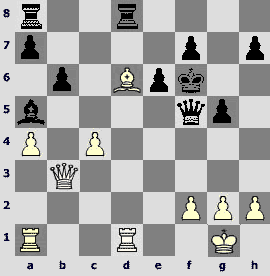 After the text move the position is almost like one in variation 7...cxd4 8.¤xd4 Ґc5 9.Јd2 0-0 10.0-0-0. The only difference is that Black's queen stands on a5 already. Vladimir Potkin uses this circumstance skilfully. 11...Ґxd4! 12.Ґxd4 ¦b8! Preparing to move the b7-pawn without a7-a6 in order to save the a6-square for the bishop. 13.ўb1 b5 14.¤e2 b4 15.Ґe3 Ґa6 16.¤d4 ¦fc8. Black disposed his forces comfortably and at least he has no problems. 17.¤b3 Јa4 18.g4 ¦b7! Coupling at the c-file still more strengthens Black's position. 19.Ґg2?! Driving the bishop away from the f1-a6 diagonal was of no good. 21...¦xc2! Quiet 21...¤c4 is possible but Vladimir decides it was time to attack. 22.¤xc2 Ґc4 23.b3? White's situation is disturbing but their defensive possibilities are not exhausted yet. 23.a3? Ґa2+ 24.ўxa2 ¦xc2° loses but cold-blooded 23.¤xb4! Јxb4 24.¦d4! (else 24...Ґxa2+ 25.ўxa2 Јa4+ 26.ўb1 ¤b3 with checkmate) 24...Јa4 25.¦xc4 (25.b3? 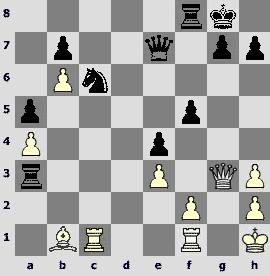 ¤xb3 26.axb3 Јxb3+ 27.Јb2 Јxe3°) 25...¤xc4 26.¦c1 led to the unclear position. 25...Јa2! The final feature. White has no acceptable defence. 14...Ґg5. A rare move. 14...¤d7 is usual. 15.Ґxg5 Јxg5 16.a5N. The refusal of approved 16.¤a5 Ґc8 17.¤c4 Јe7 18.¤b6 ¦a7 19.a5 with advantage (Kovalev – Gallagher, Batumi 1999) is hardly excusable. 16...¤d7. Every side hunts chopped off opponent's pawn. 19...¤xd5! The sign is for the accurate calculation though 19...Ґxd5 20.g3 Јh3 21.Ґxd5 ¤xd5 is good also. 20.g3 Јh3 21.¦xb7 (21.Ґxd5 Ґxd5 22.ўg1 Јe6і) 21...¤e3 22.Јe2 ¤xc4 23.¦d1. 23.Јxc4? turns out to be prohibited due to 23...¦ac8 24.Јe2 ¦xc2! 25.¤d2 ¦xd2!, so only White could have problems. 23...¤xb2. Black wants to spoil White's pawn structure but the b2-knight stand awkwardly. 23...¦fc8!? 24.c3 Јe6. 24.¦xd6 ¦ac8 25.ўg1. 25.¦b4!? ¦fd8 (but not 25...¦xc2? 26.¦d2 ¦xd2 27.¤xd2 ¦c8 28.¤f1! 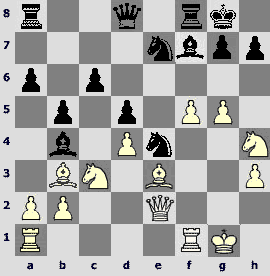 capturing the knight) 26.¦xd8 ¦xd8 27.¤d2 Јd7 equalizes. 26.¦xa6? As we shall see, the pawn was 'poisoned'. 26.¦dd7 was better, controlling the central file. 26...¦fd8! 27...¤e3 is a very strong threat. 27.¦aa7. White needs a good advice. The following is forced. 27...¤e3! 28.¦c7 ¦d1+ 29.ўf2 ¦cd8! 30.ўxe3 Јh6+ 31.f4 (31.ўf2 Јxh2+ 32.ўe3 Јg1+°) 31...exf4+ 32.ўf3 (32.gxf4 Јh3+ 33.ўf2 ¦h1!°) 32...fxg3 33.Јxd1 (33.¦xf7 Јh5+ 34.ўe3 Јxf7 35.¦xf7 ¦e8+°) 33...Јh5 34.ўxg3 Јxd1. A realization of extra queen with the exposed king is not very difficult. 1.e4 e6 2.d4 d5 3.¤c3 ¤f6 4.e5 ¤fd7 5.f4 c5 6.¤f3 ¤c6 7.Ґe3 a6 8.Ґe2. 8.Јd2 is essentially more popular and stronger. 8...b5 9.a3 Ґb7 10.O-O Јc7!?N. A preparation to castle queenside, which is in Ian's style and will do for the opted variation. 11.Јd2 O-O-O 12.¦ae1?! 'Not that way!' 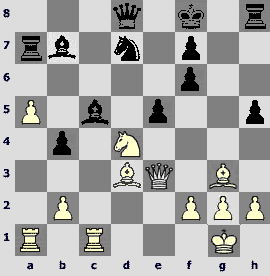 In the light of the events followed, White should think of prophylactic 12.ўh1 or to choose 12.a4!? b4 13.¤d1 (V.Belov). 12...g5! A typical method to destroy pawn bastions of White. 13.fxg5 (13.¤xg5?? cxd4 14.Ґxd4 ¤xd4 15.Јxd4 Ґc5°) 13...cxd4 14.¤xd4 ¤dxe5 15.¤cxb5? The decision that is difficult to explain. 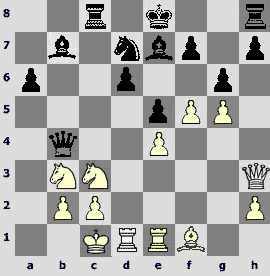 Possibly, White underestimated his position under normal continuations. But giving away the piece is unjustified, speaking mildly. Indeed, after 15.¤xc6 Ґxc6 (15...¤xc6 16.Ґf4!?) 16.Ґd4 or even 15.Ґh5!? chances are mutual. 15...axb5 16.¤xb5 Јe7 17.Јc3 ¦g8. It is a great question – what for White sacrificed his knight. 18.¦f4?! The g5-pawn is important not by itself but as a cover in the g-file, and the rook transference along the 4th rank brings nothing real. Stronger is 18.h4 to free the e3-bishop on occasion. 18...¦xg5 19.¦b4 ўb8! Preparing for a decisive strike. 20.¦b3? Loses forcedly, but 20.¦a4 d4! 21.Ґxg5 Јxg5 or 20.Ґxg5 Јxg5 21.¦b3 ¤c4!? hardly could help seriously. 20...¦xg2+! 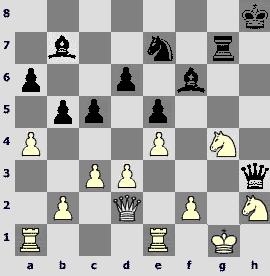 In case of 20...d4 White could resist longer by 21.Ґxg5 Јxg5 22.Јg3. 21.ўxg2 d4! 22.¤xd4 ¤xd4+ 23.ўh3 ¤ec6. Computer insists on 23...¤g6 24.¦xb7+ ўxb7! °, but the text move is not worse. 24.¦b4. 24.Ґxd4 ¤xd4° and 24.¦b6 Јc7!° is hopeless, and if 24.Ґb5 then 24...e5! (24...¤xb3 25.Ґxc6 is not so clear) 25.Ґxc6 Јe6+ 26.ўg3 ¤xc6°. 25...Јg5! The last feature. A threat of checkmate on g2 deprives White of any hope. 1.d4 d5 2.c4 c6 3.¤c3 ¤f6 4.e3 e6 5.¤f3 ¤bd7 6.Ґd3 dxc4 7.Ґxc4 b5 8.Ґd3 a6 9.e4 c5 10.e5 cxd4 11.¤xb5 axb5 12.exf6 gxf6 13.O-O Јb6 14.Јe2 b4. Rather actual line of Meran variation, Kotanjian repeatedly playing it as Black. 19...Ґe7N. 19...Ґa6 happened in Kashdan – Horowitz, New York 1946. 20.a5! Alexander Moiseenko acts very active and purposefully from now on. 20...Јd8. The following piece sacrifice possibly turned out to be an unpleasant surprise for Black. 20...Јa7!? is of interest. 22.¤xd4! A typical decision for this sort of positions but nonetheless spectacular. 22...Ґb7! The best move. 22...exd4 23.Јxd4 ¦a8 24.Ґc7! Јe8 25.Ґb5 ¦g8 26.Ґf4! (26.¦d1? ¤e5!) 26...¦g6 27.¦c7 ¤e5 28.Ґh6+ ўg8 29.Јxe5ќ is hopeless. 23.Јe3! Weaker is 23.¤c6 Ґxc6 24.¦xc6 ¤c5. 23...Ґc5. 23...exd4?! 24.Јxd4 ¦xa5 (24...¦a8 25.a6ќ) 25.¦xa5 Јxa5 26.Јxd7 Јd5 27.Јxd5 Ґxd5 28.¦c7± leads to a hard ending. Lesser of harms was 23...¦xa5!? 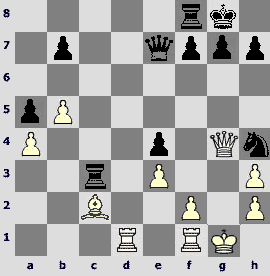 24.¤f5© with strong initiative of White. 24.¤e6+? The key point of the game. White might lose his advantage. 24.¦xc5? ¤xc5 25.¤e6+ ¤xe6 26.Јxa7 Ґxg2!› was bad also, but 24.Ґxe5! fxe5 (24...¦xa5 25.¦xa5 Јxa5 26.Ґxf6! ¤xf6 27.¦xc5!ќ) 25.¦xc5! would put serious problems for Black. Both 25...¤xc5 26.Јxe5 ўg8 (26...¤xd3 27.Јxh8+ ўe7 28.¤f5+ ўd7 29.Јd4+ќ) 27.Јxc5 Јd5 28.Јxd5 Ґxd5 29.a6± and 25...exd4 26.Јxd4 ¦g8 27.g3± lead to difficult positions. 25...¦a8? The crucial mistake. 25...h4! would be right followed by exemplary 26.Ґxe5 (in case of 26.¦c4 ¦xa5 27.¦xa5 Јxa5 28.Ґxh4 ¦xh4! 29.¦xh4 Јa1+ 30.Ґf1 Ґa6 or 26.¦b5 Јa8! White might have problems) 26...fxe5 27.¦ac1 ¦g8 28.¦c7 Ґxg2 29.Јh6+ ¦g7 30.Јh8+ ўf7 31.Јxd8 Ґh3+ 32.ўh1 Ґg2+=. 26.¦b5. White calmly eliminates the b4-pawn. 26...Ґa6?! Loses almost at once though 26...Ґc6 27.¦xb4 ¦xa5 28.¦c1± also brings no joy. 1.d4 ¤f6 2.c4 e6 3.¤c3 Ґb4 4.Јc2 d5 5.a3 Ґxc3 6.Јxc3 ¤e4 7.Јc2 c5 8.dxc5 ¤c6 9.e3 Јa5+ 10.Ґd2 Јxc5 11.b4 Јe7 12.Ґc1 a5 13.b5 ¤e5 14.Ґb2 ¤g4 15.¤h3. First happened in Rjumin – Capablanka, Moscow 1935, with the following 15...Јh4 16.g3 Јh6 17.Јe2! with White's advantage. Zoltan Almasi improves third World Champion's play. 15...O-O! ?N 16.Ґe2. 16.f3!? ¤xe3 is of principle and leads to unclear complications. 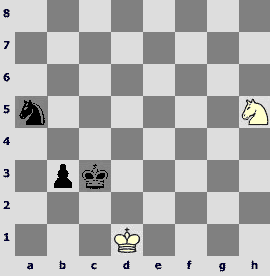 Shortly, White should consider various retreats of his queen. 16.Ґd3 is also possible. 16...e5! 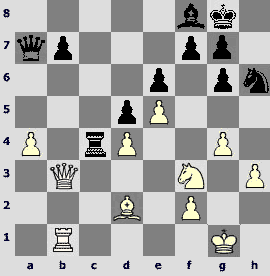 Restricting the h3-knight and disregarding the d5-pawn. 17.cxd5 ¤gf6 18.Ґd3 ¤d6! For a pawn Black has comfortable blockade play. 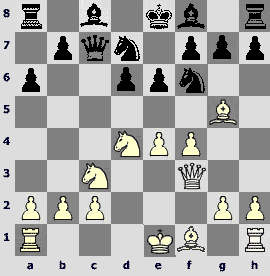 After White's kingside castling Almasi immediately weakens the king's residence. 21.Јe2?! 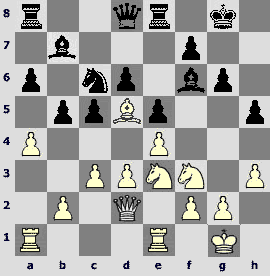 21.Јb3 is more accurate, defending the d5-pawn and leaving the e2-square for the bishop. 21...e4 22.Ґc2 ¤xd5. Material status quo is restored and Black keeps initiative. 23.¦ad1 ¤c3 24.Ґxc3 ¦xc3 25.a4 ¤f5! The knight goes to f3. 26.Јg4 ¤h4 (26...¤xe3?! 27.fxe3 ¦xc2 28.¦d7). 27.Ґb1?! 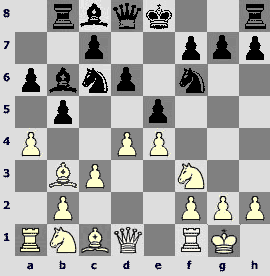 White should not permit f7-f5. In case of 27.Ґxe4 h5! 28.¦d7! (after 28.Јf4? g5! 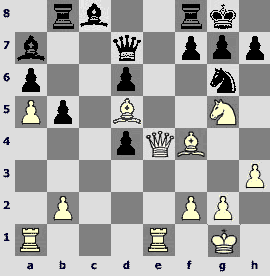 White loses a piece) 28...Јe8 29.Јxh4 Јd8 30.Јxh5 g6 Black keeps the upper hand but 27.¦d7!? ¤f3+ 28.ўg2 Јf6 seems to be stronger and now not 29.Јxe4? ¤g5! 30.Јf5 ¦xc2! but 29.Ґb1. 27...f5 28.Јg3 ¦a3 29.¦c1 ¤f3+ 30.ўh1 ¤e5?! 30...f4! 31.Јg4 (31.exf4 ¤d2) 31...fxe3 32.fxe3 ¦xe3µ is more convincing. 32.¦cd1? White misses his chance. 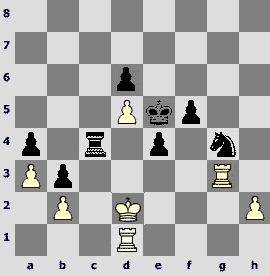 He must to search for escape in endgame, variation 32.Јc7! (threatening with 33.¦xc6!) 32...Јxc7 33.bxc7 ¦c8 34.f3! 32...¦xa4 33.f3 exf3 34.Јxf3 g6 35.e4 ¦a3 36.Јg2. 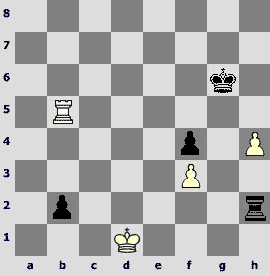 Rook ending after 36.Јf4 fxe4 37.Јxf8+ Јxf8 38.¦xf8+ ўxf8 39.Ґxe4 ¦b3 40.Ґxc6 bxc6 is lost for White. 36...f4! Actually, the curtain is down. 1.e4 e5 2.¤f3 ¤c6 3.Ґb5 a6 4.Ґa4 ¤f6 5.O-O Ґe7 6.¦e1 b5 7.Ґb3 O-O 8.h3 Ґb7 9.d3 d6 10.c3 ¤a5 11.Ґc2 c5 12.¤bd2 ¦e8 13.¤f1 Ґf8 14.Ґg5!? One of anti-Marshall variety is played. A struggle for the d5 key-point begins. 14...h6 15.Ґh4 g6 16.¤e3 Ґg7 17.Јd2 ¤c6 18.Ґb3 ¤a5 19.Ґc2. Immediate 19.Ґd5 Ґxd5 20.Ґxf6 Ґxf6 21.¤xd5 Ґg7 22.b4 ¤c6 23.a4І happened in Nisipeanu – Zhang Zhong, Medellin 1996. 20.a4! ?N ¤b8?! 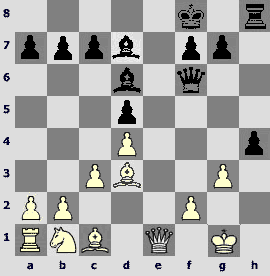 Now White can comfortably return his bishop to b3. Black could not play 20...Јd7? because of 21.Ґxf6 Ґxf6 22.¤d5 with threats to b6 and h6, but 20...b4!? was worth considering. 21.Ґxf6! Right now, while black knight did not come to d7. 21...Ґxf6. 21...Јxf6? 22.¤g4 Јf4 23.Јd1! 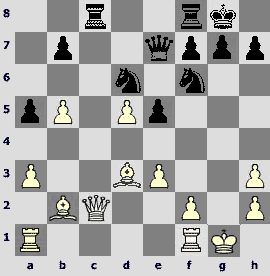 trapping the black queen (24.g3 threatens). 22.Ґb3 h5 23.Ґd5. 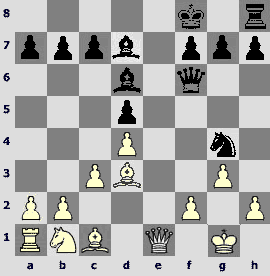 If white-squared bishops are exchanged, White shall obtain a powerful knight on d5 and visible positional advantage. 24.g4! White attacks at the whole front line. The opponent rushes into desperate counter-attack, not wishing to perish ingloriously. 24...Јd7?! Black sees that 24...h4 25.¤g2 and 24...hxg4 25.¤xg4 is in favour of White and does not want to defence passively. 25.gxh5 Јxh3 26.hxg6 ўh8 (26...Јxf3 27.gxf7+ ўh7 28.fxe8Ј ¦xe8 29.axb5 axb5 30.¤f5ќ) 27.gxf7 ¤e7 28.fxe8Ј+ ¦xe8. 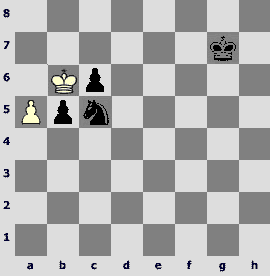 Black sacrificed a rook and hopes to make use of uncovered position of the white king. 29.Ґf7. To return part of the material is, in principle, the right idea, but to keep the bishop on board seemed more accurate: 29.Ґa2! Јxf3 30.axb5 axb5 31.Јd1ќ. 32.¦e3!? A non-trivial method of realization. Almasi gets two rooks against three light pieces noticing a bad position of the black monarch. Simple 32.f3 was also good-looking. 32...¦xg4+ 33.¤xg4 Јxg4+ 34.¦g3 Јh5 35.axb5 axb5 36.Јd1! Exchange of queens is inevitable. 36...Јxd1+ (36...Јh4 37.Јf3ќ) 37.¦xd1. The matter is that Black does not have time to centralize his king. 37...ўh7 38.¦a1! The target is the d6-pawn. 38...Ґc6 39.ўg2 ¤g6 40.ўf3 c4 41.¦a6 ¤e7 42.ўe2 Ґg7 43.f3 d5. 43...cxd3+ 44.ўxd3 d5 45.b4 would simplify White's task – Black cannot defend all weak points, moreover he must pay attention to potentially passed b-pawn. 44.¦xc6!? Nice-looking, but not a must. White could have his position strengthened by 44.¦g1. 44...¤xc6. If 44...cxd3+ then 45.ўd2! 45.exd5 ¤e7 46.d6 ¤d5? In case of persistent 46...¤f5 47.¦h3+ ўg8 48.d7 Ґf6 49.dxc4 bxc4 50.ўf2 ¤h4 White should have to work more. 47.dxc4 bxc4 48.d7 Ґf6. 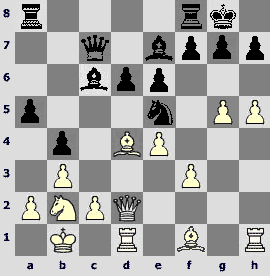 In case of 48...¤f4+ 49.ўd2 ¤e6 50.¦g4 Ґh6+ 51.ўc2 Ґf4 52.ўb1ќ the white king goes through the queenside. 1.e4 e5 2.¤f3 ¤c6 3.Ґb5 a6 4.Ґa4 ¤f6 5.Јe2. Dmitry declines actual lines of Ruy Lopez and his opponent turns out not ready for that. The opening goes clearly in favour of White. 5...b5 6.Ґb3 Ґe7 7.c3 O-O 8.d4 exd4. A possible decision but8...d6 is more reliable yet. 9.e5! (9.cxd4 d5 10.e5 ¤e4=) 9...¤e8?N. Gives comfortable advantage to White. 9...¦e8! is stronger. 10.cxd4 d5. On 10...d6 good is 11.Ґd5! 11.¤c3 Ґg4. Passive 11...Ґe6 could not suite Black. 12.Ґe3 Ґb4 13.O-O ¤e7. Taking into account easiness of White's win, one would wish to offer anything for Black, but his position is hard already. Maybe 13...Ґxc3 14.bxc3 ¤a5 worth trying. 14.h3 Ґh5 15.g4 Ґg6 16.¤h4 c6 17.f4 f5. 17...Ґxc3 is hardly much better due to 18.bxc3 Ґe4 19.f5 or 18.¤xg6!? (V.Belov). 18.exf6 ¤xf6 19.f5 Ґf7 20.g5 ¤e4?! Draws near the outcome. Variations 20...Ґh5 21.Јg2 ¤d7 22.f6! Ґxc3 (22...¤g6 23.¤xd5! cxd5 24.Ґxd5+ ўh8 25.¤xg6+ Ґxg6 26.fxg7+ ўxg7 27.¦xf8 Јxf8 28.Ґxa8ќ) 23.bxc3 ¤g6 (23...gxf6 24.gxf6+ ¤g6 25.f7+! ¦xf7 26.¦xf7 ўxf7 27.Ґxd5+ cxd5 28.Јxd5+ ўg7 29.¤f5+ ўh8 30.Ґh6ќ) 24.¤f5 gxf6 25.¦ae1± or 20...¤h5 21.Јg4± are also bad for Black. 21.g6! The final attack is ripe. 9.g4!? 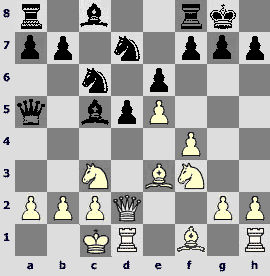 9.0-0-0 is more frequent, but Volokitin prefers to move the pawn to g5 quickly. Curiously, Teimur Radjabov acted just so against Alexander himself in Biel last year. 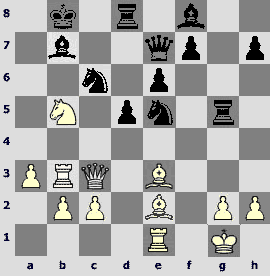 Modern grandmasters often play the same positions with both colours. 9...b5 10.Ґxf6 ¤xf6 11.g5 ¤d7 12.O-O-O Ґb7. 12...b4!? as in the game mentioned, is more of principle. White then fearlessly played 13.¤d5!? and won in the sharpest fight. No doubt, Volokitin was fully armed for this line. But what about his opponent? At least in the current game Black yielded somehow resignedly. 13.Ґh3 ¦c8 14.¦he1 Јc4?!N. 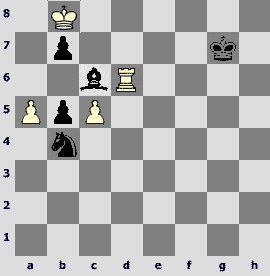 In a game of little known chessplayers Black played 14...Ґe7 and met with 15.Ґxe6!? 15.Ґf1 Јc5 16.a3 b4?! Out of place here. Better is 16...Ґe7 or 16...g6 though White have the edge all the same. 17.axb4 Јxb4 18.Јh3! g6. Otherwise, White would play so. 21.f6! 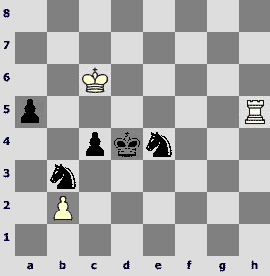 Black's position is lost strategically. His kingside is frozen. White easily drives the game to a win. At first glance, White has nothing. 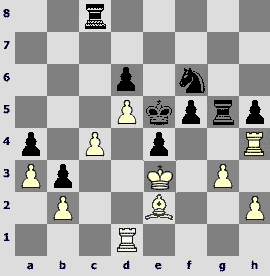 Black stands firmly, he even succeeded in seizing the c-file and penetrating into the 2nd rank. However, things are not so easy. 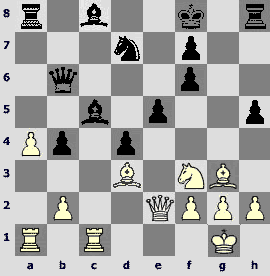 The main feature of the position is the bad knight on the h6-square. 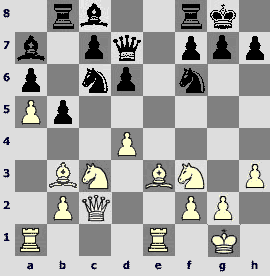 The opponent helping, Alexander Motylev succeeded to win in five moves. 26.¦fc1! 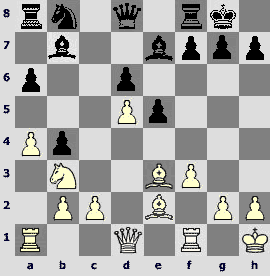 White must exchange the active rook first. 28...b6? Loses immediately. An interesting situation could arise after 28...¦xa4 29.Јxb7 Јxb7 30.¦xb7 ¦a8. I would not judge on the reality of winning chances for White, but general contours of a plan are somewhat like follows: having fortified the d4-pawn by the bishop, White withdraws the knight from f3, moves f2-f4-f5, and after taking on f5 by any black pawn plays g5 to attack the h6-knight. 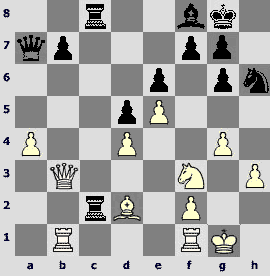 In case of 28...¦c7 Whites maintains pressure by means of 29.Јb6!?І. 29.Јxb6 Јxa4. 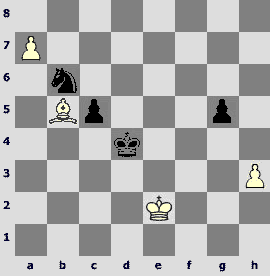 29...Јxb6 30.¦xb6 ¦xa4 31.¦b8 ¦c4 32.¦a8ќ – a zugzwang. 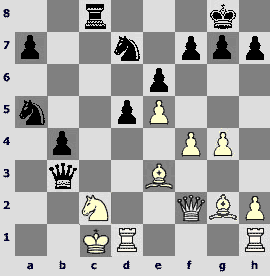 White seem to build an impregnable fortress, but next excellent Black's move destroys the illusion. 47...¦g4! 48.¦h3. If 48.Ґxg4 then 48...¤xg4+ 49.ўe2 ¦xc4 50.¦d2 (other continuations are not better: 50.h3 ¦c2+ 51.¦d2 ¤h2! 52.¦xc2 bxc2 53.ўd2 ¤f3+° or 50.¦xh5 ¦c2+ 51.¦d2 e3!°) 50...e3 51.¦xg4 hxg4 52.ўxe3 ¦e4+ 53.ўf2 ¦d4°. 48...h4! 49.ўd2. Capturing the rook is of no profit here also: 49.Ґxg4 ¤xg4+ 50.ўe2 ¦xc4 51.¦xh4 (after 51.gxh4 f4 52.¦c3 ¦xc3 53.bxc3 f3+ 54.ўe1 ўf4 55.h5 ўe3 the passed f-pawn decides) 51...¦c2+ 52.¦d2 e3! 53.¦xg4 ¦xd2+ 54.ўxe3 fxg4! 55.ўxd2 ўxd5°. 49...hxg3 50.Ґxg4. In case of 50.hxg3 ¦g5 the weak point g3 adds to White's problems. 50...¤xg4 51.¦xg3 ¦xc4. Now the tied passed pawns in the centre quickly decide the outcome. 52.¦c3. Or 52.ўe2 ¦c2+ 53.¦d2 ¤xh2 54.¦xc2 bxc2 55.¦c3 ¤f3!°. It is very difficult for Black to win. To do that he must either capture the b2-pawn keeping alive his own pawns or... checkmate, the latter occurred in the game. 66.ўa4?! Does not miss a draw, but easier was 66.¦xe3+! 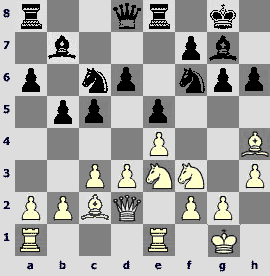 ўxe3 67.ўxc4 ¤d4 68.ўc3!, and White holds the opposition: 68...ўe4 69.ўc4 ўe5 70.ўc5 ўe4 71.ўc4 ¤c6 72.ўc5 ¤d4 73.ўc4=. 66...ўd4 67.ўb5 ¤f5 68.¦h5. 68.ўa4! 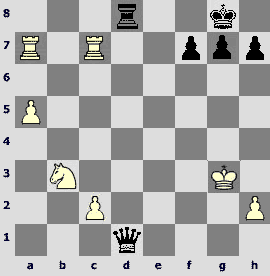 ¤e7 (otherwise 69.¦xb3) 69.ўb5! threatening with 70.¦h4+. 70.¦d5+? A crucial mistake. Now Black's king goes to c2. After 70.ўb5 ¤ed2 71.¦h3!= the position is drawn. 70...ўe3 71.ўb6 ўe2 72.¦d8. In case of 72.¦h5 ўd3 73.ўb5 ¤ed2 74.ўa4 ўc2 75.ўa3 ¤b1+ 76.ўa2 ¤c1+ 77.ўa1 ¤d2 78.¦h2 ¤d3° Black gains the b2-pawn. 60...¤a6+! This seemingly obvious move winning the c5-pawn needed accurate calculation. 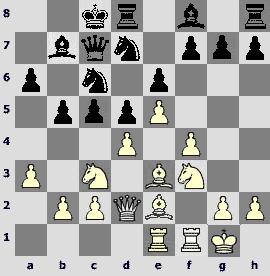 In case of 60...ўf7 61.ўa7 ¤a6 62.ўb6 b4 63.¦h6 it is difficult for Black to strengthen his position, and 63...b3 draws after 64.¦h2 ¤b4 65.¦b2 Ґd5 66.c6! ¤xc6 67.¦xb3! Ґxb3 68.a6 ўe6! 69.ўc7!! (69.axb7? ўd6°) 69...bxa6 70.ўxc6=. 61.ўa7 ¤xc5 62.¦xc6. Or 62.ўb6 ¤a6!°. 51...¦h2 52.¦b5 b2. 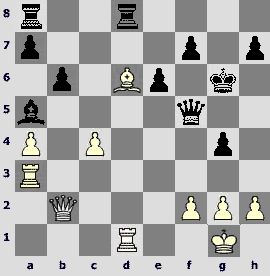 Large positional advantage of Black is determined by strong passed b-pawn and cut off white king. He has a winning position in spite of small number of pawns left. 53.ўd1 (53.¦b6+ ўf5 54.ўd1 ўf4°) 53...ўg6 54.¦g5+ ўh6 55.¦b5 f5! 56.¦b8 ўg6 57.¦b7 f4! A nice way to win transferring the game into a pawn ending. Prosaic 57...¦xh4 58.ўc2 (58.¦xb2 ¦h1+ 59.ўc2 ¦h2+ 60.ўc3 ¦xb2 61.ўxb2 ўg5°) 58...ўg5 59.ўxb2 ўf4 60.ўc2 ўxf3 61.ўd2 f4° is also permissible. 68...ўb2! Black puts his king on a1 and the pawn on b2 and the wins by distracting the white knight from the b1-point. 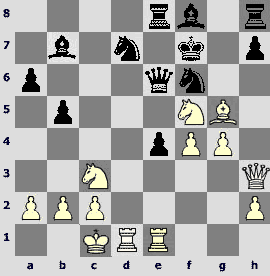 The knight standing on f4, White would achieve a draw after 69.¤d3+ ўa1 70.ўd2! – the pawn cannot step to b2. 69.¤e4 ўa1! 70.¤d2. 70.¤c3 b2 71.ўc2 ¤c4 72.ўd3 ¤a3° all the same. The black knight is tied to the a7-pawn and is ready to give up his life for it with immediate draw. 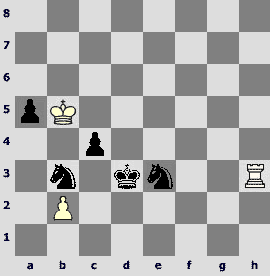 White's plan is to reinforce the pawn by the king. A way to the c7-square lies through... the h-file and the 8th rank! The c-pawn needs careful watching on the way. 49.ўc2 ўd4 50.ўb3 ўd3. In case of 50...c4+ 51.ўb4 ¤a8 (or 51...c3 52.Ґa4! ўd5 53.ўb5 ¤a8 54.ўa6 ўc5 55.ўb7 ¤b6 56.Ґd1 ўb5 57.Ґe2+ ўc5 58.Ґd3ќ with a zugzwang) 52.Ґg4! 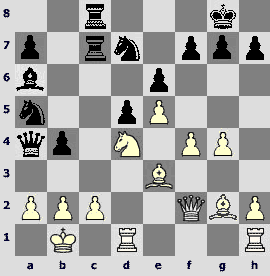 (preventing 52...ўd5) 52...c3 53.Ґd1 ¤c7 54.Ґb3!ќ a zugzwang arises and the white king breaks through to his passed pawn. 57...ўe4. 57...c4!? could be advised. White would have to find 58.Ґc6! 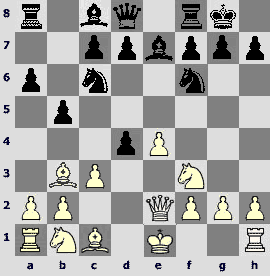 (it is necessary to take the a8-square under control in order to prevent the knight's transfer to c7; bad is 58.ўd2? ўc5 59.Ґa6 ¤a8 60.Ґb7 ¤c7! 61.ўc2 ўb6 62.a8Ј ¤xa8 63.Ґxa8 ўc5 or 58.Ґa6? ¤a8! 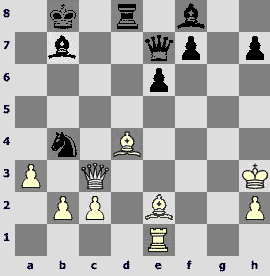 59.Ґb7 ¤c7 and Black escapes) 58...c3 59.ўd1 ўc5 60.Ґg2 ўd4 61.ўc2 ўc4 62.Ґf3! ўd4 (62...ўb4 63.ўd3 ўb3 64.Ґe4! c2 65.ўd2ќ) 63.ўb3 ўd3 64.Ґg4! ¤a8 (64...ўd4 65.Ґd1 ¤a8 66.ўb4ќ) 65.ўb4! ўd4 66.Ґd1 ¤c7 67.Ґb3!ќ. 62...ўe5 63.ўe3 ўd5 64.Ґf3+ ўe5 65.Ґe2! Before the white monarch will leave for a long way, White should take precautionary measures: the bishop has to watch the c-pawn. 72.ўg8! ¤a8 73.ўf8 ¤b6 74.Ґb5 ўe6 75.ўg7 ўf5 (75...ўd6 76.ўf6 ўc7 77.ўxg5 ўb7 78.h4 c4 79.h5 c3 80.Ґd3 ¤d7 81.h6 ўxa7 82.h7 ¤e5 83.Ґc2ќ) 76.ўf7 ўe5 77.Ґa6 ¤a8 78.ўe7 ¤b6 79.ўd8 ўd6 80.Ґb5! The last and crucial zugzwang.